How Do You Add Mixed Fractions with Different Denominators by Converting to Improper Fractions? Adding mixed fractions? You could first convert each to an improper fraction. If they don't have common denominators, then find a common denominator and use it to rewrite each fraction. Then, add the fractions together and simplify. In this tutorial, take a look at adding together mixed fractions with unlike denominators! How Do You Turn a Mixed Fraction Into an Improper Fraction? Working with mixed fractions in equations can be tough, but things get easier if you convert them into improper fractions first. Once you learn this skill, you'll find yourself using it all the time, so take look at how to convert a mixed fraction to an improper fraction. How Do You Turn an Improper Fraction Into a Mixed Fraction? In math, it's often important to change a fraction from one type to another. It can help you work with the fraction in an equation or help make more sense of an answer. This tutorial shows you how to convert an improper fraction to a mixed fraction. How Do You Add Fractions with the Same Denominator? 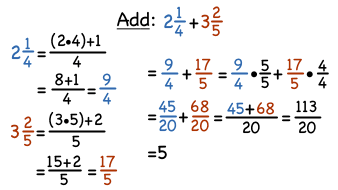 While adding fractions can be hard, adding fractions with the same denominator is just as easy as adding numbers. That's why when you add fractions you first get all of them to have the same denominator, and then add them up. In this tutorial you get to see just how easy it is to add up fractions once they have the same denominator! How Do You Find a Common Denominator and a Least Common Denominator? This tutorial gives you some practice finding a common denominator and the least common denominator of three fractions. There's only one least common denominator, but there are many common denominators. This tutorial gives you one. Can you find another? Fractions come in all sorts of flavors, and in this tutorial you'll learn how to recognize mixed numbers. How Do You Subtract Mixed Fractions with Different Denominators by Regrouping? Subtracting mixed fractions with unlike denominators? You could first find a common denominator and use it to rewrite each fraction. Then, subtract the whole numbers and fractions separately. In this tutorial, take a look at subtracting mixed fractions with unlike denominators! How Do You Subtract Mixed Fractions with Different Denominators by Converting to Improper Fractions? Subtracting mixed fractions? You could first convert each to an improper fraction. If they don't have common denominators, then find a common denominator and use it to rewrite each fraction. Then, subtract the fractions and simplify. In this tutorial, take a look at subtracting mixed fractions with unlike denominators!